Okay, actually it’s called an “Orange Fizzy”, but it’s basically an orange smoothie. And boy, oh boy is it yummy! Strawberry Shortcake made this recipe from her Sandra Lee Semi-Homemade Cool Kids’ Cooking book. 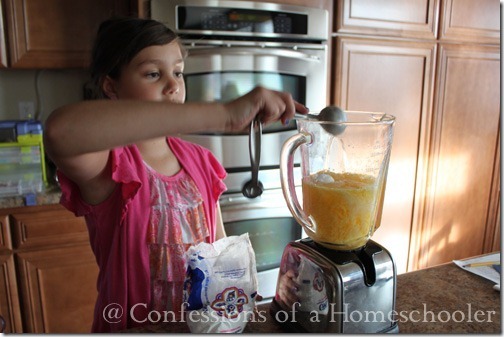 BTW, it is a great cookbook for kids, there are tons of yummy, but easy recipes to make! It’s a great gift idea too! Place all ingredients in a blender and blend until smooth! Serve with your favorite breakfast, or have as a mid-day snack! I’m sure this is tasty, but that’s a whole lot of refined sugar! 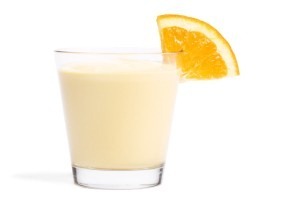 Especially if you use Sunny D.
Here is a great recipe for an Orange Julius. fill to top with ice cubes. Sounds so yummy! My daughters will love making this to help out with breakfast & snack time! The cookbook sounds like a good idea for a birthday gift, my oldest has a birthday this month! Delicious! Just made some for my girls! Thanks! PS- Nothing wrong with a sweet treat now and then! Goodness people! I’ve never tried anything like this, but it has definitely peaked my interest. I have several oranges that I need to use up, so I may try it with those. Thanks for the recipe! Yummy! Looks like a delicious drink! We love the orange fizzy! My son and I also did this recipe and then added some pineapple and strawberries. Delicious!